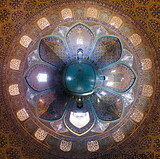 The Sheikh Lotf Allah mosque (known as Masjed-e Sheikh Lotfollah in Persian) lies on the eastern side of the Naqshejahan square. The facade of the mosque is beautifully decorated. A corridor leads to the amazing main dome chamber, whose walls are covered with beautiful inlaid and polychrome mosaics. The mosque was built between 1615 and 1618. It has no minarets.